All of these make me really happy! They are so cute - especially the Volkswagen! The holidays are coming up - I know that I have about a zillion birthdays coming up and then there is Christmas. These mugs would make great gifts. It is never too early to start holiday shopping (I have!). 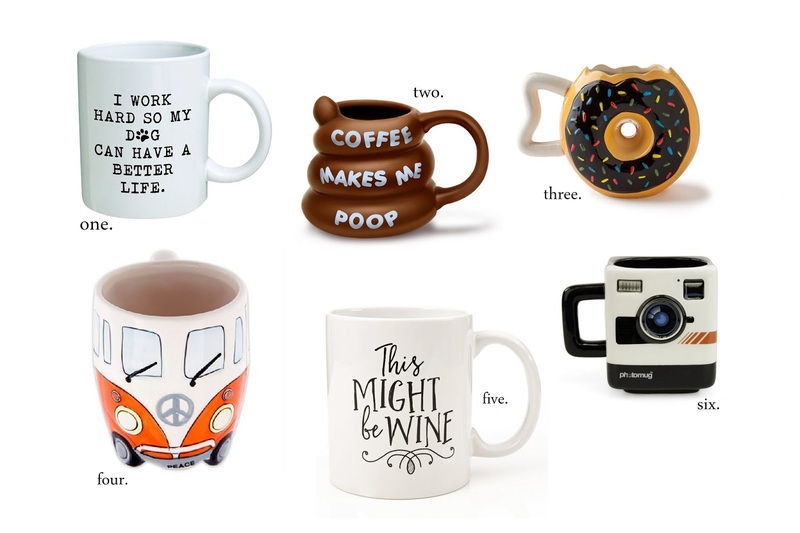 Check out my first mug round up here (spoilers, there is a repeat!). 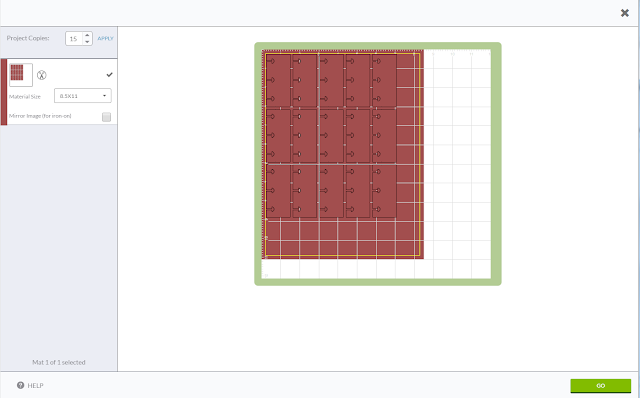 From the home screen, open a blank 8 x 10 canvas. Use the crop feature to size the image to a proportion that will work with your personal planner - iPhone 6 is a good choice, it is not exact but the proportions come out pretty close. Deselect Scale photo to give you the best quality to work with. Click Apply. Choose a canvas color, I chose a purple color. From the Overlays tab (the one that has a butterfly icon) overlay a Halloween border and a rectangular box. Be sure to move the box so that it is resting on the right side of the page leaving room on the left side for the hole punches. Make your best judgement with alignment since there are no grid lines. Adjust the transparency of the rectangle and the Halloween border. Add 31 pumpkin overlays - or any other item you'd like (bats, candy corn, ghosts). Once you are satisfied with the arrangement flatten all layers together using the Combine all image elements button in the lower middle menu bar. This will flatted all elements together so that you don't move them while continuing to add to the design. Add the text you would like - I used the font Coolock Black to add the label Halloween Countdown at the top and the font Flavors to add the numbers over the pumpkins. The 31st day on this countdown is Halloween so start with the number 30 then count backwards. Coolock Block is a Royale font and I highly encourage you to upgrade from the free subscription to a paid one. The Royale subscription gives you access to a ton more fonts and overlays and most importantly, the new Hub feature. Did I mention hub lets you go from desktop to mobile? Storing your creations for you to use again and again? For only $4.99/mo or $39.99/year, the subscription is sooo worth it. Find out more here. Save this to the Hub by clicking the Add to Hub button in the top menu. Name your creation, and save. Using the undo button in the bottom menu, undo everything you just did (yikes!) to get back to the base layer. Move the rectangle over to the other side leaving room for punching this insert on the right hand side now. You can use this to make anything you'd like - I made a movies to watch list. Once your satisfied, click on Update in Hub in the top menu. You should see a pop up that asks if you want to Update (overwrite the original design) or Make a copy (save your new design as a copy). Chose Make a copy and you'll see the copy show up in your Hub. Use the tail end of this tutorial to create a document using your new inserts for printing. Now you have a fun printable countdown (and one for a friend since printing this guy back to front will yield you two inserts!). I've also created some stickers for you to place over each day as you count down. And if you'd like to skip the tutorial all together, download the countdown inserts below as well. This download includes the PDF inserts, a PNG file for cutting the stickers with your Cricut Explore (size the width to 5.5 inches, keep the proportions locked), a Silhouette Studio file for cutting the stickers with your Silhouette, and a PDF for cutting the stickers by hand or using a gyro tool as found here. As with all printables on the blog these are for personal use only. You can not sell the digital image or the final product. You can not distribute these in mass quantities. Do not claim this project, design, or file as you own. If you would like to share this project on you Pinterest or social media, please share the link to the post, do not Pin the file download only. As always, thank you for playing nice. And if you'd like some more Halloween inspired notes pages to print out - the sugar skulls and pumpkins & bats - find that post here. Guess what!?!?! It is finally time - I have a a free printable sticker set that is made for both Cricut users & Silhouette users! I've started to create some stickers for both machines. Plus a PDF if you've just got your own two hands. This week is Pizza night stickers. I made these both because I love pizza and because I remember going to get pizza or eating pizza at home with my family. So this would be great to mark family nights, too. As with all printables on the blog, these are for personal use only. Do not sell the design or the finished product, do not claim these as your own. Do not print and disseminate this in mass quantities. If you would like to link to these stickers, please pin or link to the post not the download itself. To use these with your Cricut Explore, upload the PNG, erase the branding strip, and size the width to 5.5 keeping the proportions locked. To use with your Silhouette Machine, open the studio file and set the red line to your settings for kiss cut, and the blue line to your settings for cutting all the way through your sticker paper. If you're going to cut these by hand, try this tool. I hear good things! Hope you enjoy! If you'd like to find more Cricut Ready printables, click here. For all Free Sticker Friday posts, click here. To find all free printables on the blog, click here. Next week will be just for the silhouette & a PDF. I haven't worked through all of the stickers I designed in Silhouette studio yet...but I will! Sometimes I hoard supplies. If you watched my office tour, you'll probably have seen that. Sometimes I hoard supplies for like ages - pretty sure this project I'm sharing today is made with supplies I've had since college. So that means I've had the supplies for this for 5 years. Not all the supplies, but the main ones. The type of eraser used for this product is important. You'll need a really good rubbery eraser - not the pink ones, not the brown ones that crumble easy, but an eraser that will stand up to being carves. I used this brand but as it is super crazy expensive on Amazon, I suggest looking in the art/drawing supply section of your craft store to find this sort of eraser. This is key because not all erasers are made the same. Start with a sketch of how you'd like the cactus to look. I realized that pretty much this cactus is just a repeating shape in varying sizes. Practice drawing the shape you'd like a few times until you get the hang of it. The shape is pretty much a U shape fattened at the curve and narrowed at the tips connected by another, smaller arc. Using the box cutter, carefully chop the erasers into two parts. Don't cut them directly in half - make sure you have four different sized eraser parts when it is all said and done. On each bit of eraser, draw the fattened U shapes in varying sizes using the pencil. Don't be afraid to change the shape up, after all you are drawing with pencil on an eraser so you can rub the marks off! Once the shapes have been drawn, use the linoleum cutting tool to trace and carve out the images. You want to carve away the negative space. So carve around the outside of the shape you've made. Use the size 1 blade for detail and the size 3 blade to remove bigger chunks of eraser. Use the size 1 blade to make little divots to represent the cactus needles. Be careful, this tool is very sharp so be careful not to stab or cut yourself. After carving out the designs, use the box cutter again to carefully narrow down the shape. Don't cut too much off...cut just enough off so you will be able to better guess where you are stamping the image. Again, be careful here! When you are satisfied with your stamps, choose your ink and do a test stamp. I found that my Memento Dye Ink did not work as well as the Chalk Ink I had. But play around with your inks to see what works best for you. Do a few test stamps to see how you'd like your cacti to look and figure out the best pressure to use with each stamp. Then move on to stamping on the paper of your choice. I chose to stamp on some off white card stock after drawing little pots with a black fine tipped marker. These are great for framing, for sharing, for use as a pocket scrapbooking element, etc. If you have a bigger eraser you can carve a bigger stamp but these are perfect for 3 x 4 and 4 x 6 inch size prints. I love these guys and really want to use these in a spread in my Memory Planner! Saving money is an important thing to me. I like to spend money but I like to spend it wisely! The Dollar Tree has become essential store for me & my budget. Finding affordable solutions for various areas of the home is sometimes hard to do. I know the Dollar Tree hasn't always been my first choice for anything but recently I've found affordable and attractive decor & storage solutions as well as quality everyday essentials. Not to mention you find something new nearly every time you walk in! 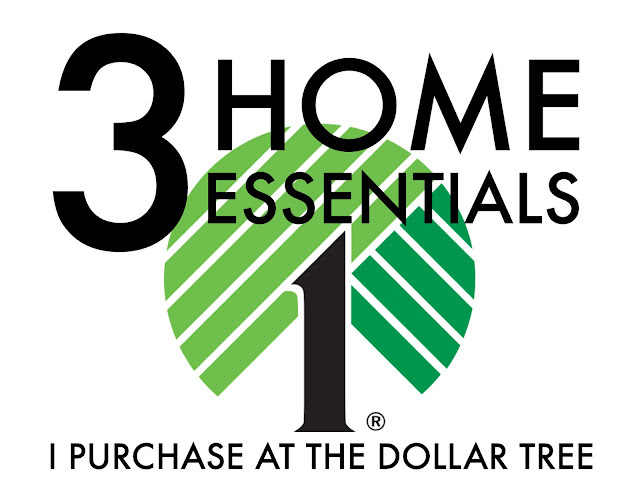 Here are my home essentials from the Dollar Tree. In this post about creating various cleaning caddies with Dollar Tree products, I used some super cute plastic bins. I also mention how those caddies help me with the 3 Waves Cleaning Method here.I love the Dollar Tree for the various storage solutions they offer. If you want the best selection of storage containers in store, I've found the best time to go is at the beginning of the year. If you're looking for a specific color I'd suggest looking during a holiday that color would be more common. For example - pastel durring Spring/Easter, brown during Fall/Thanksgiving, purple during Halloween, red during Christmas, etc. They do offer an array of colors in general but shopping for storage solutions seasonally will give you the best chance to match any existing colors you my already have going on in the space you need storage for. Fall is nearly here and Halloween will be around the corner. Dollar Tree is my favorite place to go for some essential crafting supplies. While sometimes the supplies may not be as full - like a bundle of flowers, for example - I love picking up smaller filler pieces and wreath bases. These more affordable starting points and accents are great to add more to a project you may have started from the craft store. I love to purchase things like wreaths to use as a base to make a fuller wreathe because I'm paying $1 for a base rather than upwards of $3-$5 to start my project. Their Fall selection of decor is warm & inviting while the Halloween offerings are creatively frightening. If you haven't checked out the Dollar Tree blog for creative inspiration you should check that out as well. They've got quite a few fund projects to try using their seasonal products! The bulk buying option also means you'll always have what you need on hand. While that may not be the best for kitchen utensils, it is great for gifts & decor as you get more bang for your buck! Do you frequent the Dollar Tree? What are your money saving must haves? These stickers are just in time for your Friday night plans - if you've got time to print them before you head out! These cute pear stickers are super flipping cute - I mean you and your date are the perfect pair....right? If you're not familiar with what's happening here, this week for Free Sticker Friday are stickers created to be cut with the Cricut Explore. This is a PNG image with a transparent background - simply upload to Design Space, erase the branding strip, size width to 5.5, and hit Go! You can cut this using the Silhouette Cameo or Portrait as well, you'll just have to create the trace in the program. I have started to work on stickers designed for both the Cricut and the Silhouette so keep a look out for those in the near future! As will all printables on the blog, this is for personal use only. Do not sell the file or the end product, do not claim any part of this as your own. Do not disseminate the end product in mass quantities. If you would like to share, link, or Pin this please link to the blog post and not the sticker file itself. Please play nice, and thanks for all the support! Find all Free Sticker Friday posts here. Happy Planning! If there is one thing I love in the world it is fighting for the under dog. When it comes to the planner community, the Cricut Explore is definitely the under dog for sticker making. I've got a ton of tutorials on my YouTube channel going over quite a few of the ways you can use your Cricut Explore to make planner accessories but I wanted to do a little round up post of 3 free programs that can supplement Cricut Design space since it can be a little finicky at times. Inkscape is a free illustration software that you can download from Inkscape.org. I love this program because you can create SVG files to use with in Cricut Design space. I created the SVG files for the Happy Planner Bookmark DIY here on the blog. The program seems complicated, and if you aren't familiar with an illustration program you might be overwhelmed. However, there are a ton of tutorials on YouTube - and if you find something that is done in Adobe Illustrator you can totally find a tutorial for it in Inkscape. You may be familiar with the pixlr or pixlr-o-matic app (I've talked about it ages ago here, here, here, & here) but this is a mini photo editing boss - the Pixlr Editor - that runs from your browser. It reminds me of Photoshop Elements, only this is a very light version. 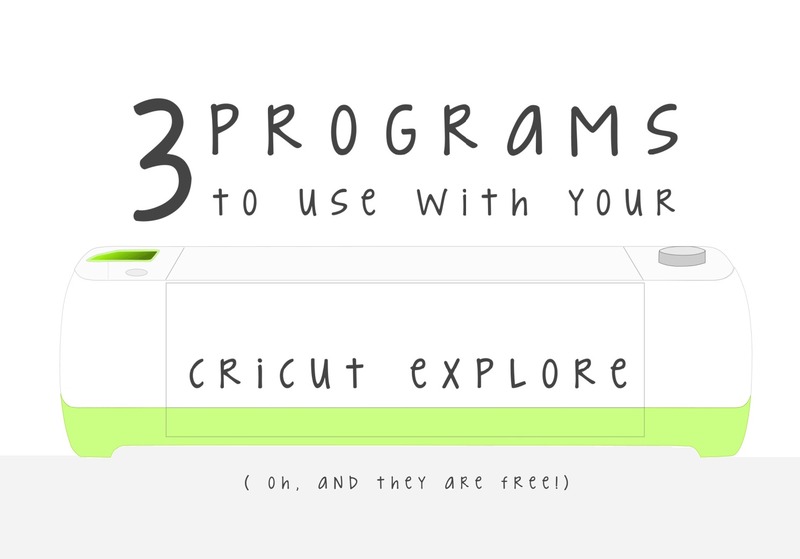 Anyway...if you watched this video on cutting free PDF printables using the Cricut Explore you'll have seen this before. You can use any black out files that come with you PDF printables to easily isolate the elements on the page for upload to Cricut Design Space. You can also use this editor to open PNG or JPG files - so if you have an image you'd like to work with before uploading it to Cricut Design Space, this is a good program to use. It does a little bit more than your basic guy (like PicMonkey). Not to mention it supports a transparent background so you can create something that your Cricut Explore can cut! Speaking of PicMonkey - PicMonkey is also a really fun tool to use with your Cricut explore. This online program also supports a transparent background so you can create some fun stickers from their overlays. Additionally, if you don't want to download fonts to your computer you can play around with some fun ones they have and upload the PNG to Design Space to cut. One of my favorite things to do is to make a faux pattern using some overlays (or even fonts) to get really cool backgrounds. You can learn how to do that in this post. It is also really simple to create glitter text with PicMonkey which you could use to create a dashboard for you planner! The best part is that all of these programs are free! You don't have to spend a crazy amount of money on anything to create wonderful stuff. There are plenty of free programs to use to bring your ideas to life - buying the most expensive softwares don't make your creative. Your creativity makes you creative and you can express that creativity with the resources afforded to you for free! What are your favorite programs to use with your crafting? Any other suggestions? Guys, I know I squeezed in some free stickers already this week...but that really didn't fall into my free sticker schedule...so here are some more! I'm using these glitter headers in my memory planner this week and I'm trying to get what all the hype about them is. I mean I like glitter and all but I'm not sure I'm 100% on the glitter header train (that sounds very, very strange) but I'm all about jumping on the #plannerbandwagon. You never know unless you try! So if you're interested in downloading these guys you'll be able to download the Silhouette Studio file. There are a bunch of colors - not just the fall ones you see in my Memory Planner spread. Perhaps I'll get to making a Cricut Version...but I'm not 100% sure how well it will print! Remember, all files offered on the blog are for Personal Use Only. Do not sell the file or anything created from the file. Do not disseminate the final product in mass quantities. Do not claim the file as you own. If you would like to link to this free printable please link or Pin this post and not the digital files. Thanks for playing nice.